Entertain your guests in style with our sets of dining table and 8 chairs in stunning painted, mango and oak hardwood. Breathe new life into your dining room with a spacious, beautifully crafted set of dining table and 8 chairs from our extensive collection. Featuring painted, mango and oak dining tables in a variety of shades, as well as both genuine leather and premium fabric dining chair chairs, our dining table sets are designed to draw compliments from your guests. Able to comfortably entertain up to eight people, our sets of dining table and 8 chairs are perfect for medium to larger dining areas and are sturdy so they’ll withstand heavy usage for many years to come. Constructed from 100% solid hardwood, we never cut corners when it comes to quality. Our dining chairs are also built from 100% natural wood and upholstered with genuine leather and long-lasting fabrics. A few little extras can really help perfect your hosting skills and create a comfortable space your guests won’t want to leave. The addition of something like a 100% solid oak sideboard creates the perfect space to store drinks and mix cocktails, whilst a stylish mirror can add a touch of class to the room. Framed posters, prints, or personal photos surrounding your dining area can also inject warmth and personality into the space and can make for fantastic conversation starters too. Every dining table and chairs we produce is crafted from premium materials and undergoes rigorous testing to ensure you get grade-A standard furniture in your home. Cared for properly, your Oak Furnitureland dining room set should last for a lifetime of memories, which is why we recommend giving it a little TLC from time to time. Using a Clear Wax Polish will not only enhance the natural beauty of your furniture but nourish and protect too. When cleaning your furniture, products containing bleach and alcohol should be avoided at all costs, as they could strip or stain the wood. Keep drinks coasters to hand, as coffee stains and water rings can quickly appear when care is not taken, and always use tablecloths and placemats for dining. If your home is prone to extreme hot or cold weather, then you may want to invest in a humidifier/dehumidifier, as wood swells when humid and shrinks when too cold. Finally, preserve the natural colour of your solid wood furniture by keeping them out of direct sunlight for long periods of time. 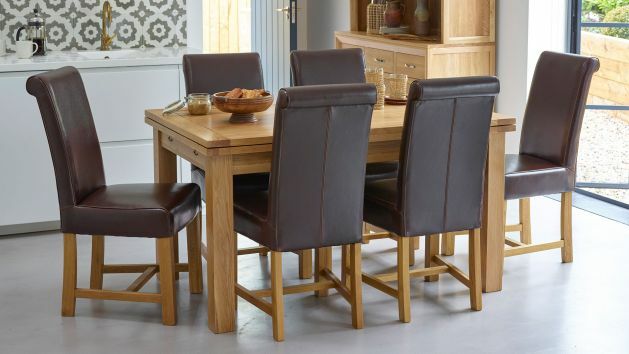 All our sets of dining table and chairs come with free delivery as standard, and you can have your dining table set taken directly to your in your dining room. Explore our flexible furniture financing and spread the cost of your beautiful oak dining set to make affordable monthly payments.